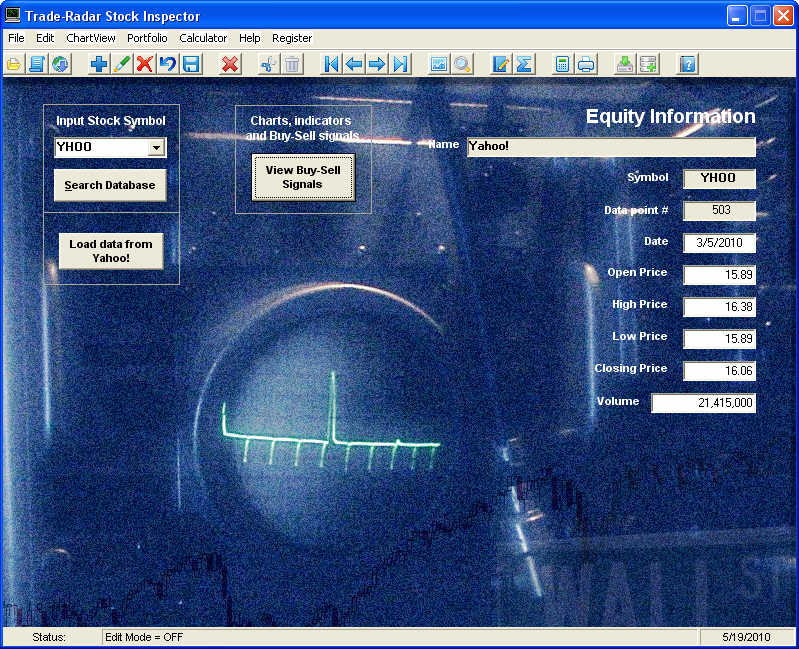 At long last the newest version of the Trade-Radar Stock Inspector software is available for download. For those of you who have not tried the earlier versions of the software, it might be worth it to review the basics before we get into the new features. Basically, the primary function of the Trade-Radar system is to identify reversals in price movements. These reversals are translated into BUY signals or SELL signals. The trick, of course, is to determine if the reversal is significant enough to enter a trade with confidence. We've added a ton of new indicators to help you make that decision. Furthermore, the Trade-Radar software makes it easy for you to assess the valuation and financial strength of any U.S. stock in which you might be interested. If you believe that risk is lower when you invest in stocks that are not over-valued, then these indicators are just what you've been looking for. Now that we have the basics out of the way, we can start to describe all the new functionality that has been added. First, the install process is greatly simplified and now works on more varieties of PCs. The next thing you would notice is that we've added a toolbar. It is now much more obvious all the different pieces of functionality that the program offers. Included on the toolbar is an icon that links to a vastly improved help file in standard Windows format that is organized with a table of contents and is completely searchable. The chart screen has also been improved. In addition to previous functionality allowing you to automatically set the chart to identify trading signals, generate trend lines, moving averages, slope lines and Fibonacci retracement lines, you can now save settings, reset settings, change between candlesticks or open-high-low-close bars and, if you right-click on the top chart, you will find a whole bunch of options for changing chart attributes and looking at the data. The first one is the TradeRadar Technical Analysis tab. Here we describe all the proprietary TradeRadar indicators including signal strength, angle-of-attack, trend difference, the "In the Zone" indicator and the new statistical indicator that evaluates slope lines and standard deviation. The next tab provides all the Standard Technical Analysis indicators. Included now are the following: Aroon, MACD, DMI, Chaiken Money Flow, Slow Stochastics, Williams %R, Bollinger Bands, 20-day moving average, 50-day moving average and moving average cross-over. Each indicator has a quick help button and is also explained in the help file. The third tab is dedicated to Fundamental Analysis. Included are the following indicators: Annual Dividend Yield, Qtrly Revenue Growth, Qtrly Earnings Growth, Beta, Return on Equity, Enterprise Value/EBITDA, Debt to Equity, Market Capitalization, PE, Price-to-Sales, Price-to-Book, PEG, Annualized Cash Flow Yield, Debt-to-Equity Ratio, Cash flow to Debt Coverage Ratio, Survivability, Return on Assets, Dividend analysis including yield, forward dividend rate and dividend sustainability. All told, we now have 36 separate indicators that are evaluated and results displayed with a simple red-yellow-green light so you can tell at a glance how the stock is doing. Those 36 indicators are the 36 reasons you should download the software but, actually, we're not done yet. The old Portfolio system wasn't very robust. The new one provides everything you need. It now supports unlimited trades, scaling in or out of trades, long or short trades and a summary report on closed trades as well as status of open trades. For open trades, the summary pulls latest market data to show you whether the position is currently profitable or not. 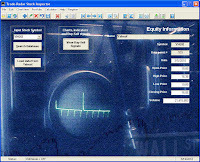 In the past, all versions of the Trade-Radar software were completely free. With all the improvements that have been made, we felt we had no choice but to begin to charge a modest fee for it. As we worked on the software, we liked it so much that we came up with the following slogan: "So good we had to make it shareware!" Note that after the 45-day free trial expires, the Dashboard will be disabled. You can re-enable the Dashboard by registering the software and obtaining a key. We have a redesigned Download page and I hope you'll check it out. If you opt for the 45-day Free Trial, you will have an opportunity to sign up to receive emails for the Trade-Radar Software Users Group. It a good idea to join the Users Group so you can keep up to date on new developments with the software. But next week I'll be emailing a coupon code out to all members of the Users Group that provides a $10 discount on purchase of the software. That's roughly a 25% discount. The coupon is only valid for the next four weeks so don't wait too long. You can take a look at screen shots on the Features page. In the mean time, I encourage you to download the software right away and be sure to sign up for the Users Group.